Blabber Shack: Is Yoshi a male? What are you hiding down there Yoshi? Ok...I know what you're thinking. Of course he is male. Well, it just so happens that it is not as black and white as I had once thought. After a few drinks, my friend and I got into an argument over Yoshi's ambiguous gender. I argued that Yoshi was a male. To my knowledge, he's always been referred to as HE. - There is no proof that Birdo and Yoshi are romantic partners. - Wikipedia lists Birdo's gender as ambiguous. - Yoshi can potentially be a species. Therefore there could be male and female Yoshis. (e.g. Pink Yoshis are female. Blue and Green are male...etc. - If Birdo were the female equivalent of Yoshi, then that would mean Birdo would be able to give offspring to Yoshi. - King Piccolo lays eggs and his gender is not in question. - In games, Yoshi is always referred to as "he". - While Mario gets paired up with Peach and Luigi with Daisy, Yoshi always gets paired up with Birdo which is at least suggestive. - Yoshi is referred to as "he" in wikipedia not "it" or "she"
- Pink is Nintendo's color for girls. Jigglypuff, Peach, AND Birdo. - Yoshi is a boy's name. 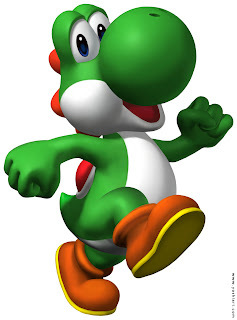 I must admit it is completely plausible for Yoshi to be a species, although I always grew up thinking he was always male, regardless of his color. Then again my friend did bring up some intriguing arguments... What do you think? I agree with Morgan. Yoshi cannot be a girl! Welcome to Blabber Shack. Random tidbits of information that I hear, read, or see about in detail. I'll sometimes make lists, ask reader questions, or place polls.